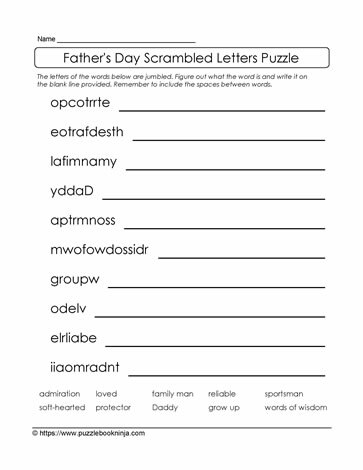 This scrambled letters puzzle for Father's Day engages the brain, supports learning in a fun way for students, helps to consolidate spelling as well as help to build vocabulary of theme based words. The list of words in the word bank at the bottom of the puzzle supports differentiated instruction in the classroom, struggling readers and English language learners acquiring English. Puzzle suits students in elementary classrooms, home schooling environment as well as a tutor resource.